This salad is amazing. It also requires a lot of ingredients so unfortunately I don't make it as often as I want to - mainly because I have no time for ingredient-rich recipes. However, every once in a while I crave it and after making it I realize - I should make this more often. It is a recipe I found on the Pioneer Woman (original recipe here) and even she claims it to be her all-time favorite. Frankly, I don't blame her. This recipe is slightly adjusted from the original and is good for 6 people, or 4 very hungry ones. The instructions are tricky so pay attention. For dressing, I like to use one of those handheld blenders and emulsify the heck out of it. The dressing is so delicious you will want to make extra and just keep it in your fridge. 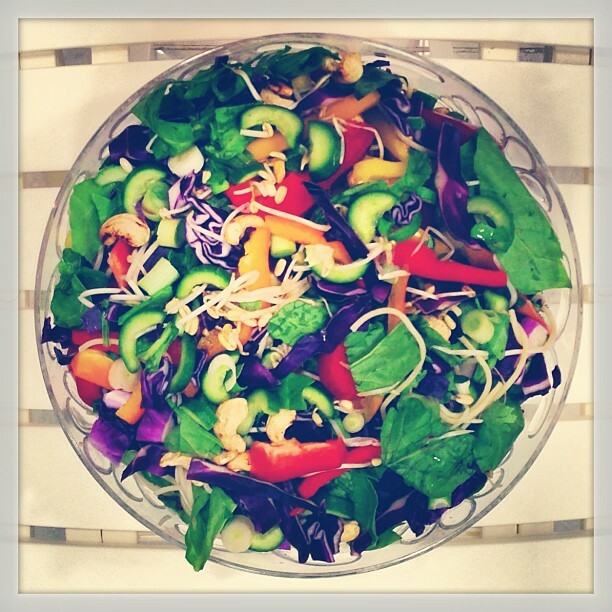 This salad is so colorful, so refreshing, so different. You will want to make it time and time again.